In 1914, Theodore Wharton introduced Pearl White to Louis Gasnier, who was preparing the scenario for the Perils of Pauline. Wharton had known Miss White earlier when she was searching for acting jobs. Upon meeting Miss White, Gasnier realized that he had found his leading lady. Wharton had established himself earlier on the Cornell University Campus in Ithaca, New York. He had successfully brought silent films first true matinee idol, Francis X. Bushman, from the stage to the silver screen. Wharton produced many successful two-reel films during the summer of 1913 with Beverly Bayne as Bushman’s leading lady. The Bushman family lived on the Cornell campus in the home of attorney Paul Clymer. The house was in a convenient location at 202 Thurston Ave right next to a tennis court. A stage was set up nearby and dressing rooms were available inside the house, trolley car service was running down the front street and the bustling campus life made the moviemaking atmosphere complete. Wharton had planned several college life scenarios for the filming schedule, which were prepared before arriving. He brought along an assistant Archer McMackin, cameraman David Hargen and property manager Al Tracey. The final cast members arrived which completed the group. Wharton planned to use the local scenery, buildings, gorges and most of all Ithacans in most of his film projects. Theodore Wharton’s wife had relatives living nearby in Ludlowville and she also had many friends in Ithaca.This is what originally had brought Wharton to the Finger Lakes area. Some of the relatives may have been the Buck family, Whartons sister Sarah had married J. Whitworth Buck and they were living in St. Louis. The chief of police in Ithaca was Edward Buck who I believe came from the Lansing/Groton area. A connection to Gene Buck who was long associated with the dancing girls from the Ziegfeld follies in New York must have existed. Wharton would bring lots of talent to Ithaca via the overnight train from NYC, starting in 1914. Wharton never forgot the beauty of the region and when a chance arrived in 1912 he came to Ithaca with a movie camera. This was the real start of moviemaking in Ithaca. Arriving in early October of 1912 he filmed the campus life, the scenery and football scenes for a motion picture being done by the Essanay Film Company from Chicago. He had little troubles capturing the needed footage and on December 6, 1912 Football Days at Cornell was released locally. He would return with a full crew in May of 1913 and moviemaking here was about to become a reality. The first film to be done was The Hermit of Lonely Gulch it featured Cornell Heights as the background and used the lower Fall Creek Falls for a dramatic photoplay. A Picturesque cabin on the island located just below the falls would also be used in the film. The island was later known for years as Essanay Island. The filming began on June 12, and later that week a big explosion at the Portland cement works (courtesy of a director’s order) would supply the final scenes for another film The Whip Hand. It was announced that a former Ithacan Robert Townley would be returning to town from Canada were he was playing in stock companies. Born in Lansing to Fred and Agnes Townley he attended the Williams School of Expression. Harry Carr, a Syracuse native who had worked with Wharton at The Edison plant and Kalem studio also arrived for filming. Both men would be associated in some way with the Whartons even after they left Ithaca and set-up The San Antonio Picture Company with Macklyn Arbuckle in Texas. Another film, Sunlight, had its opening scenes staged in Ludlowville and the Asbury Church and Rogues Harbor buildings were filmed showing people leaving on foot and in their carriages. This picture featured slum life and these scenes were taken in the inlet area of Ithaca, children playing in the dirt, a mother bending over a washtub doing laundry, while a father goes to a local saloon. Some of the kids in the film were the children of Leonard Reulein, Seville and Clifford. Leonard was a clerk at the Ithaca hotel and he himself along with his twin brother Gus would also appear in Wharton films during the 1916 season. Edward Buck, the chief of police would perform the part of a police chief in the picture For Old Times Sake a part which he performed quite naturally. Friends who noticed him in Omaha when the film was released easily recognized him. He also would continue in the movies made here until 1919. Harry Carr, often played a police officer and when needed real police were always ready to step in. The film crews also went to Sheldrake for the beautiful scenery there and the buildings were used as background for the production of A Woman Scorned. Originally titled Little Ted, A Woman Scorned also featured attorney Paul Clymer, who had leased his home to the moviemakers, he portrayed a local man in a western bar taken apart by a gang of miners. In the mining camp scenes several more Cornell Heights residents appeared including the young son of Mr.& Mrs. Louis Fuertes who resided nearby on Wyckoff Avenue. Sumner Fuertes had a juvenile lead role and would rescue Bushman after one of the most realistic fights yet obtained by the film company took place on the edge of the falls. Both actors eventually went tumbling down the falls to a watery landing soaked was Francis X. Bushman and actor William Bailey. Then work shifted to Geneva NY were a nearby railroad company was installing tracks. This would provide a natural scene that would be used in the next production. Then the filming moved to the Slaterville area for scenes at The Hollister estate. Another set of tracks was to be run through a small cemetery, located near the farm. This was being done against the owner’s wishes. Timothy Hollister portrays the local sheriff sent to stop the construction and the scene fit perfectly in the dramatic photoplay when shown locally. The film was entitled The Right of Way and the biggest highlight of the picture was the audience reaction to a car plunging 150 feet down the Taughannock Falls. This scene startled the viewers and made for an exciting finish. A dummy was placed in the car just prior to Robert Townley, the driver, having exited the vehicle. Some crewmembers helped shove the car off the precipice. Most of the valuable parts of the car had been stripped including the exhaust and engine before it plunged off the cliff. After the scene was done and filming was completed the wreck was removed and the tires were ordered returned if in usable condition. This was the first car thrown off of a local gorge. But of course this would not be the last time such an event would happen during filming locally. For the production of The Love Lute of Romany a band of real gypsies was used and Robert Townley took the part of Raoul, a gypsy poet and troubadour, with affections toward the fiery gypsy chiefs daughter. A fight takes place around Beebe Lake and at points along the fall creek gorge. The cutting down of a tree that crashes down the gorge toward the gypsies fighting below was very effective. In still another production Antoine the Fiddler Cornell University proctor Lt. Theodore Tweston appears as an inhabitant of a border town. Actor William Bailey would be injured during the filming of a horse riding sequence. Attorney Paul Clymer and neighbor Louis Agassis Fuertes would also appear in several scenes. In the film Bushman who plays the part of "Tony" an Italian musician whose stagecoach is held up by "Big Bill" a desperado on whom the sheriff has placed a huge reward, dead or alive. Tony is taken by force to Big Bills hideout located just below the Ithaca Falls. Tony later lulls Big Bill to sleep with his melodic fiddle playing. He then succeeds in capturing him, handing him over to the sheriff very much alive. Then he collects the reward. The Toll of the Marshes was filmed in the Montezuma swamps and in the inlet valley. The selling of swampland for farmland leads to a dispute between two men. When again they meet at a tent city, in the west end part of town where many scenes were staged, a furious fight takes place. In the film Dear Old Girl Francis X. Bushman portrays a Cornell student named Ted Warren, (not Wharton) who has plans for an upcoming wedding. Beverly Bayne plays his beau, Dora Allen. Dora visits Ted regularly on the campus during the school year. As the wedding day approaches Dora takes the train to Ithaca to meet Ted at the Lehigh Valley Station located downtown so they can finalize their plans. As the clock tower starts chiming out the melody of Dear Old Girl of Mine Ted has his faithful servant played by Ithacan Eugene Gladsby take him to the train station. Upon arriving at the station the servant gets news that Dora has been in an accident while in route to the station in her hometown. She has died and will not be arriving, the servant can not find the strength to tell this to Ted. They both return to the campus and in the insuing days each time the chimes toll Ted insists on going to the station to meet his fiancée and his servant obeys and takes him and returns empty handed. After several weeks of continuing this routine Ted after hearing the chimes again slips out of the house on his own and makes it down to the station where he hears the sound of an approaching train. In his delusion he runs on the train tracks into an on coming train. His servant arrives shortly after the train stops blowing its whistle. Looking around he notices something up ahead and he recovers Ted’s body from the sidetracks. At home the next day as the chimes ring aloud Ted has a vision and looking towards the sky he sees the image of Dora as an angel with her arms spread open beckoning him to come join her. He passes on and reaches the pearly gates with Dora at his side, the Cornell tower continues chiming out the melody as the scene comes to an end. This film was so well received by the public that it was re-released in 1915 which is something that was seldom done with such short films. Just before the film was shown locally Eugene Gladsby, who appeared as an Uncle Tom character in several of the other productions filmed here, died after an illness at the city hospital. In tribute to him a bouquet of flowers with an Essanay Indian head on it was sent to his Center Street home. 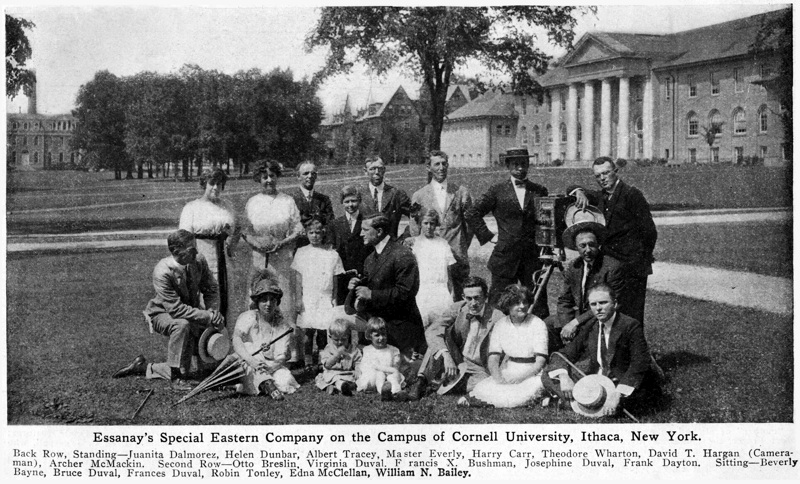 As the filming was ending for the Essanay Company, one of the owners George Spoor visited Ithaca because he was so impressed with the quality of films that Wharton had produced. The cost of filming without a real studio was quite high and The Essanay Company then told Wharton to find a site for a permanent studio. Around that time, Mr. Lund head of the Eclair Film company, arrived in town and was looking for a location to stage a winter mountain film. Then on August 22, a contractor Leopold Wharton from the Pathe’ company arrived with hopes of filming in Ithaca. He also was told ‘hands off’ not while Ted Wharton was already working the area. So Ted’s brother Leopold left town without permission to film. But the next year would see both Brothers producing films locally under the newly formed Wharton Inc. for the Pathe’ Company. One last event was to occur and it would shake up the whole town. Bruce Bushman, the son of Francis X. Bushman, was leaning against the screen of an upstairs window in the Thurston Avenue house. He fell from the second story window and was seriously injured and it was feared that he would die. He fortunately survived the fall and the journey back to Chicago was only delayed until he recovered. Bushman and Bayne would return to Ithaca in 1916 to film The Adopted Son for the Metro Film Company where they were now both employed. In 1917 the popular on screen romance of Bushman & Bayne was about to be tested. They had won a popularity contest and were voted the King and Queen of the silent screen back in 1913/14. Then came the announcement that Bushman & Bayne had been married for many years. This would destroy both of their careers. Many of their fans had believed the on screen romance was acting and not real. Although they were adored by the public and were both heartthrobs of so many the truth would be too much for them to undo. Wharton began working for Essanay in 1911 as a writer of stage plays, something he had been doing in motion pictures since landing his first film work at the Edison Studio in 1907, as a writer. Later he became scenario editor and studio supervisor. He had been seasoned in the theatre atmosphere having been the treasurer for the Dallas Opera house, Hopkins Grand Opera House and Hammerstein’s Victoria Theatre in NYC during the 1890’s. He appeared on the stage with E.H. Sothern, Augustin Daly, John Drew and others until opportunity took him to Edison. He worked for Kalem in 1908 and in 1909, he built Pathes’ first American Studio in Jersey City. Theodore then ended his ties with the Chicago based Essanay Film Company because they would not build a special Eastern Essanay studio in Ithaca. Wharton vowed to return to Ithaca after he completed his last film for Essanay in late 1913. That final project would become film history’s first eight-reel epic "The War of the Civilizations" for the United States War Department. The film featured actual recreations of major Indian battles, and it included the famous "Buffalo Bill" Cody, who became good friends with Wharton and later would bring his road show to Ithaca. This was the first film to be produced with preservation of it in mind, unfortunately less than 2 minutes of it survives today. It was released later as "The Indian Wars." After completion of the film, Ted Wharton would return to Ithaca to establish his own film studio. The Whartons also produced several feature films during 1915; one that included Pearl White and was entitled Hazel Kirke and another was The Lottery Man which featured in a bit part a young Oliver "Babe" Hardy as a female cook. Hardy had appeared earlier in several chapters of the Wallingford serial long before connecting up with Stan Laurel. Pearl White who arrived in town and stayed at the hotel. It has long been rumored that Pearl did all of her own stunts. Not true, in Ithaca, her stand in was a local girl Francis White who wore a blond wig and stood in many times for Pearl. Once tied to a freezing log rushing down Cascadilla Creek, Francis performed admirably while Pearl looked on as the perilous action was filmed. Pearl smoked, drank, swore and even wore pants as she raced around town with her wire-haired terror. She was getting her fair share of speeding tickets in her yellow stutz bearcat. Irene Castle walked around town with her monkeys she also wore an ankle bracelet and attended church in town. After filming Patria she put her Marmon automobile up for sale. A young cadet, Robert H. Treman purchased the car and would later secretly marry the actress. After her husband Vernon Castle died in an aviation accident on Valentines Day 1918, they secretly wed in August of the same year in South Carolina. They denied local claims they were married, they then moved in together at 106 Cayuga Heights Road. Property that was a wedding gift from Tremans family. The couple was then publicly married in 1919, at the little church around the corner in New York City. They made several feature films together until Irene’s money ran out in 1922 because the films produced for Holtre Productions were unsuccessful. Treman had used Irene’s money without her knowledge since his father ran the local bank and he had access to her account. In 1923, Irene was granted a divorce in Paris, France even after Treman sailed across the ocean and pleaded with her not to humiliate him. The Tremans’ went around town buying up all the local papers in an effort to keep the divorce quiet so it would not become local gossip. In addition, a 1916 film The Black Stork was also produced, it was a controversial film that dealt with tainted blood that caused birth defects in newborns. Hearst had publicized the famous "bollinger " baby case in many of his newspapers and the propaganda generated by the accounts brought about the desire to bring the subject to local theatres. The furor caused by the showing of the clinical victim’s deformities brought about censorship of the film. It was deemed not a form of entertainment and was not fit to be shown to the public without some warning of its content. The film was released by The Sherriot Film Company and on a states rights basis. It was retitled and re-released in 1927 as Are You Fit to Marry?. Little evidence of The International Film Service involvement appeared during the filming. The Whartons’ may have produced it Independently as Hearst was pondering producing it himself. No International actors appeared in the picture and Wharton’s actors performed the secondary parts. Dr. Harry Heiselden, who was the real doctor that did not operate on a deformed baby and let it die, played himself. His name was linked to the case and was in all the headlines. The production was arranged by the Whartons while Hearst was busy with his numerous other ventures as he must have been during the filming of The Mysteries of Myra which probably accounts for the fact that the film was completed in a timely manner. Distribution of The Black Stork would not be a problem the Whartons apparently sold it outright for $35,000. The Wharton Studio had actually produced an independent feature film in a short time during the lapse between the Mysteries of Myra and Beatrice Fairfax series. The rigorous shooting schedule was nothing new to Wharton he had the skills to do several things at one time. Wharton Studio had stepped in and got the picture done and it exists today. The 63 minutes of the Whartons production is literally placed in the middle of a 1928 film Are you Fit To Marry? they had just added a new 9 minute intro to the beginning that would set-up the telling of the Black Stork story. In addition, a different ending was created that urged blood tests before marriage. Alan Murnane and Elsie Esmond were featured in The Black Stork as was Leopold Wharton’s wife Bessie and it was filmed in Ithaca in mid July of 1916.